When you need a vehicle you can count on, the Honda CR-V will not let you down. My Honda CR-V is a great compact SUV, ultra-reliable, comfortable with great visibility, and with the excellent ground clearance and all wheel drive, it is nearly unstoppable in the winter! It is a bit noisy inside at certain speeds and the suspension can be somewhat harsh compared to newer or higher-end vehicles on hard bumps and railroad tracks, but nothing unforgivable. The factory stereo is mediocre at best but sounds decent and is easy and intuitive to operate while driving. Cargo carrying is a breeze with the barn-door style rear door and our dog can jump right in, but because it opens to the side, be careful as it can get caught by the wind and be forced open or closed. Mine also came with a cargo roof rack which is extremely useful in hauling large items, skis, snowboards, bikes and even lumber from the home improvement store. Fuel economy is around 23 mpg and acceptable for my average day to day use, but if you rack up extensive miles, you may want to look at the front wheel drive version which gets slightly better mpg. 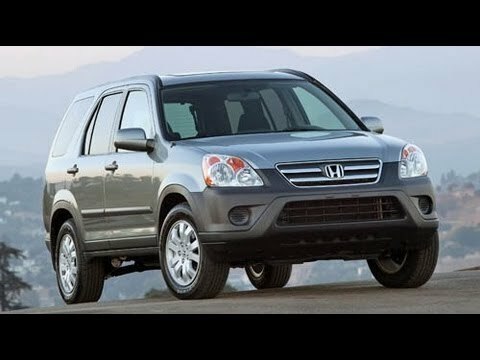 Bottom line: the 2006 Honda CR-V is an over-achiever for daily tasks, hauling, commuting, sports and family events, and offers outstanding performance in adverse weather, but will remind you occasionally that it is definitely not a luxury sedan. The Honda CRV, 2nd Edition is a versatile, well-built vehicle. It's a reliable daily driver and a fun car to own. Versatility is probably the CR V's best feature. It's reliable, easy to work on mechanically and is still stylish. I was used to luxury cars prior to this vehicle but have grown to love it. It will be a project car when I do finally purchase a new car. Honda has a great following and a large aftermarket culture. There are some things that I don't love about the particular model, such as the side opening rear cargo door. It is heavy and restricts all access to the right in some cases. The (mechanical) parking brake is in a ridiculous spot in the middle of the dash and is cumbersome. If I had the choice, I would've preferred a more powerful engine option. Lastly, there have been a number of recalls, as well as an unaddressed issue with the AC (which is essential in FL) completely failing, and requiring a full system replacement vs one or two parts. 2006 CR-V longevity and durability. I purchased my CR-V in 2006. It was my first "new" car. I had previously had a sedan with a large trunk. Plenty of storage. I got a flyer from a local dealership about sales on this vehicle. I drove down with my father and test drove it. The representatives were amazing. The car drove impeccably. Great steering. Great handling. I loved the pickup and go engine. That day, I traded in my old car and purchased the crv. It is such a spacious vehicle. I love the rear folding seats. It allowed me to transport furniture and such from one residence to another with incredible ease. It is 12 years old, and has just over 50k miles. It is on it is second batch of tires. It still gets great gas mileage. The air conditioner and all other features still work as though it were brand new. Two other members of my family have had crv and they loved them.